Welcome to Tiki Tides! 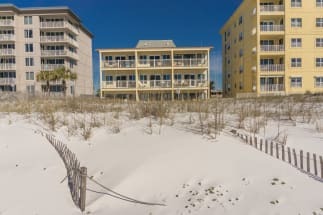 These For Walton Beach condo rentals sit directly on the sand on Okaloosa Island in Florida! 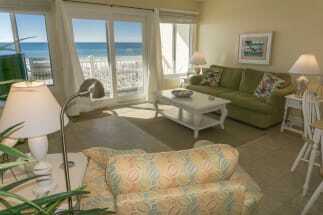 Enjoy your morning coffee overlooking the Gulf of Mexico from your private balcony. Enjoy convenient beach access directly from the complex. Tiki Tides is perfect for a family vacation, couples getaway or even just a relaxing week with friends. The location is ideal, Tiki Tides sits just a few blocks from Fudpuckers, Alvin's Island, Wings and more! If you are looking to relax but also have access to fun things to do, Tiki Tides is a great choice for your next vacation. Things to do at Tiki Tides. Tiki Tides is surrounded by activities and things to do! Head down to the beach and relax by the ocean waves, play sand volleyball on the beach or head over to the Okaloosa County Pier for some afternoon fishing. There are many restaurants to choose from in the area along with countless "mom and pop" shops and tourists shops. The whole family is sure to have a good time when staying in Fort Walton Beach. 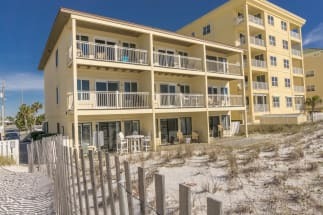 Book your Okaloosa Island condo on ECBYO.com. ECBYO provides guests with the ability to talk with Tiki Tide property owners directly. Booking direct with the owner will allow you to save on your next vacation! Tiki Beach 33 directly on the Beach.